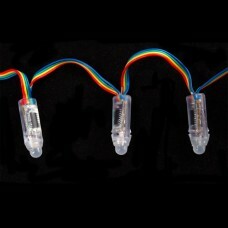 WS2801 Flat-Pack RGB Pixel displays are digitally-controllable LED lights which can be set to any color, or animated. Each display contains an RGB LED along with a dedicated WS2801 controller chip. We have models that are weatherproof and sealed in clear silicon casing and others that are open-frame. The weatherproof models feature flanges molded in so that you can 'push' them into a 12mm drill holes in materials up to 1.5mm/0.06" thick. This item is our open-frame model. 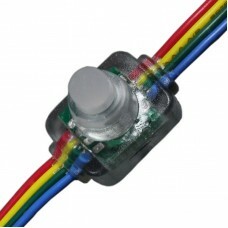 The RGB pixel is connected by a 4-conductor cable. Data is shifted down from one pixel to the next so that you can easily cut the strand or attach more onto the end. 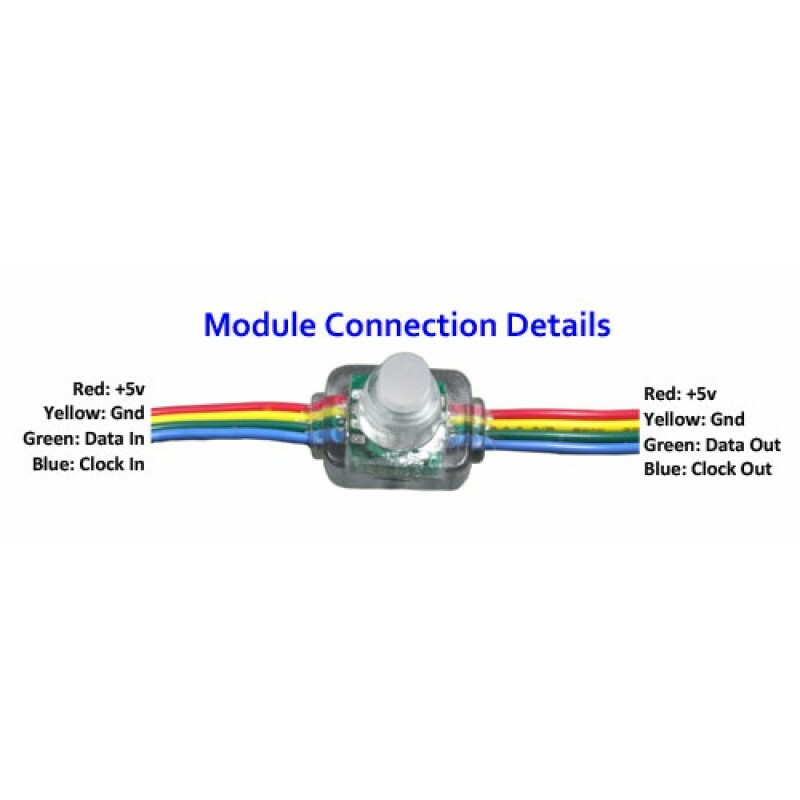 The four connection wires carry the following signals: +5V (Red), Gnd (Yellow), Data (Green) and Clock (Blue). Pixels are digitally controlled, with an internal 8-bit PWM LED driver (24-bit color for 16 million different shades). Pixels must be clocked by a microcontroller, or other control devices. 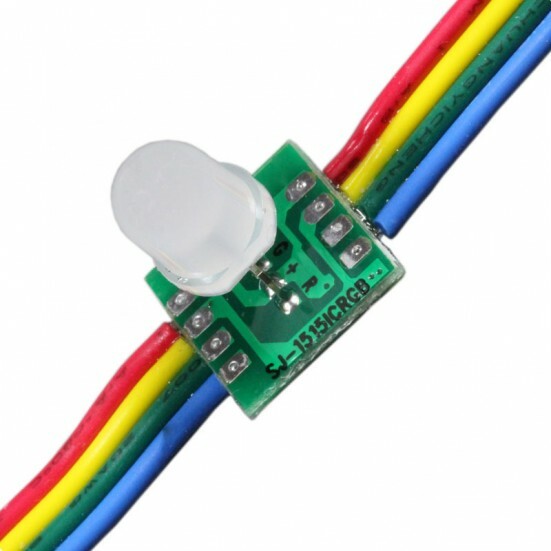 There are many examples around the web available showing simple connections and code for the Arduino as well as other microcontrollers. Each pixel contains an 8mm diffused (frosted) RGB LED, with a 120 degree beam width. 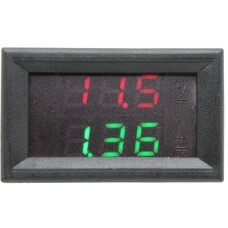 Brightness of the display for each color is approximately Red = 3.3 Lumens/300 mcd, Green = 10 Lumens/1000 mcd, Blue = 2.7 Lumens/300 mcd (mcd calculation based on full 120 degree beam) for a total of approximately 1600mcd and due to the diffused frosting design of the LED light is evenly distributed. 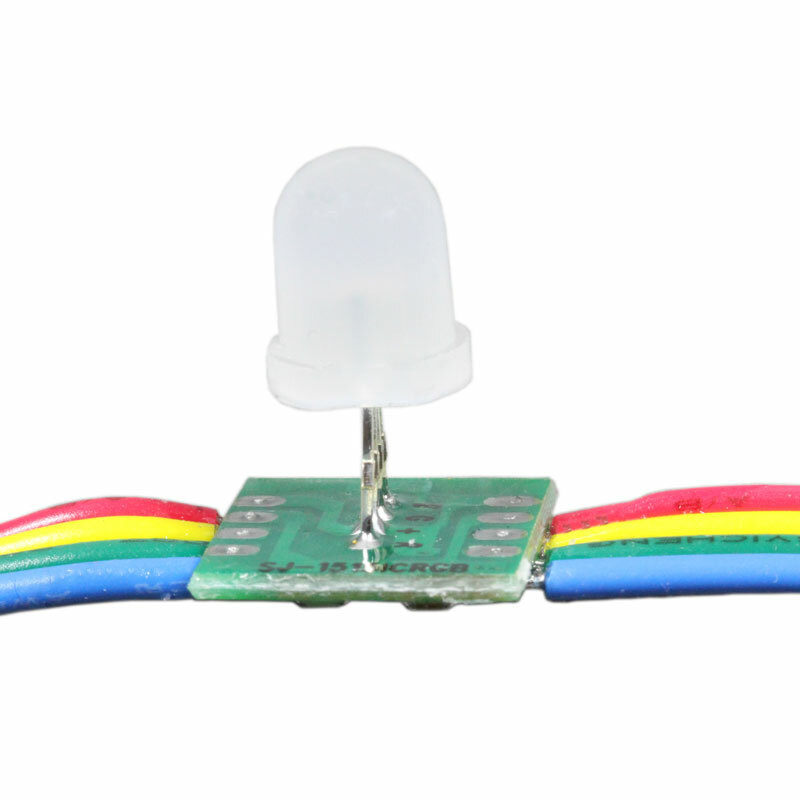 The pixel displays are normally sold in strands of 50 pixels with a JST SM 4-pin connector on each end allowing you to chain modules together, this item is for a string of 25 pixels and may not come with a JST SM connector on either end. A complete datasheet with specifications on the WS2801 driver chip is also available. 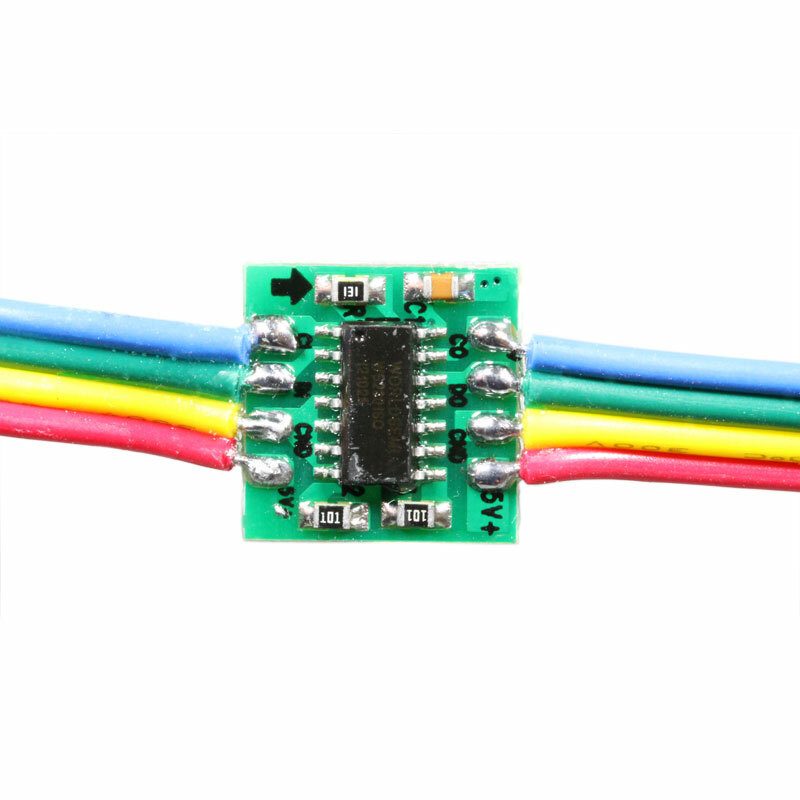 Modules are designed to run on 5v DC. Exceeding the power specification most certainly will damage pixel modules. Silkscreened on the bottom of the PCB module is an arrow (►) which indicates the direction of flow for the displays. Your signal input must be placed on the input to the module. 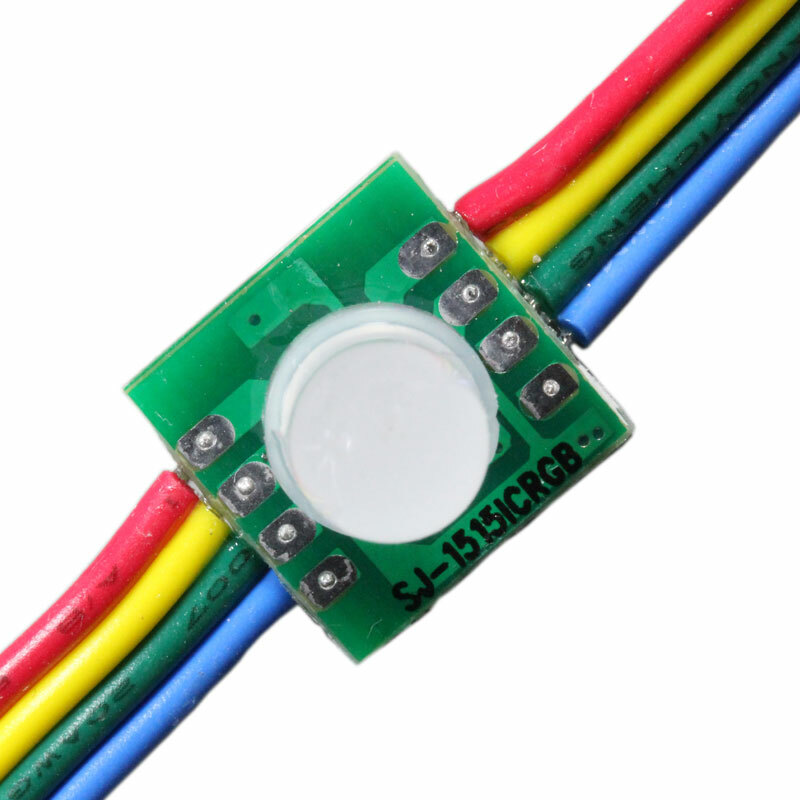 For strings of modules less than 50-pieces, you may not receive any kind of JST SM connector at all, as they will be cut from a standard string of 50. 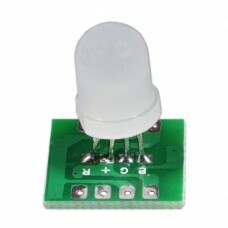 WS2801 RGB Pixel displays are digitally-controllable LED lights which can be set to any color, ..